The Foundation believes every individual should be empowered to achieve their full potential through continuing educational opportunities throughout their lives. Current funding strategies in education focus Foundation resources on early childhood/family literacy education; after-school learning; and career and technical education. The Foundation believes in education as a pathway out of poverty for children from low income families. 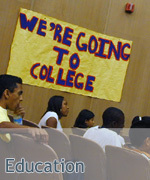 A compelling body of national research suggests that a particularly effective way to help children from economically disadvantaged families be successful in school is to improve family environments by providing educational services to the whole family, as early and in as comprehensive a fashion as possible. Read more about the Foundation’s interests, efforts and results associated with early childhood/family literacy education here.